My morning started with being woken up with a kiss from a smiling one year old. Is there any better way to start the day? It really is something special, and a great reason (should I need to name one) to co-sleep. Once awake we lay in bed singing nursery rhymes. We sung "Head, shoulders, knees and toes" complete with actions over and over and over again. By the time we had got up I felt as if I'd done a good ol' workout at the gym! Chelsea and Joseph had a lie in as they have both had an emotional couple of days. The younger ones and I came down and had breakfast, with the sun shining beautifully through the window. I managed to get some time on the computer to sort out bills and reply to emails whilst the 3 awake children entertained themselves. Tiegan was reading, Callum was playing on the Xbox (Skylanders), and Taisia surrounded herself with various toys and was content with being alone and left to her own imagination. One of the latest things she has started doing is taking hold of a doll's arm or stuffed animal's paw and saying "How do you dooo?" as she gives it a gentle shake. Ultra cute. It was quickly time for lunch, when Chelsea and Joseph graced us with their presence. They seemed a lot chirpier by this time and I think the sleep-in did them the world of good. I was reminded that this was another huge plus for home-education. Children are able to take life at a pace suitable to their emotional state, health and general well-being. With the teenage hormones raging, the obvious ails of growing and developing, it is really no wonder that more sleep is needed at certain times more than others. I felt very fortunate not having to stress about making sure the teens were up and out of the house before 9am today. We had a stroll to the library to return borrowed books and bring more home. I once again had to pay a fine (£2 this time!) and really must get into a more organised routine. I think I will try the return date on the calender and in diary thing. On the upside we haven't lost a book for a while. At home we snuggled up on the sofa and read some of the books. 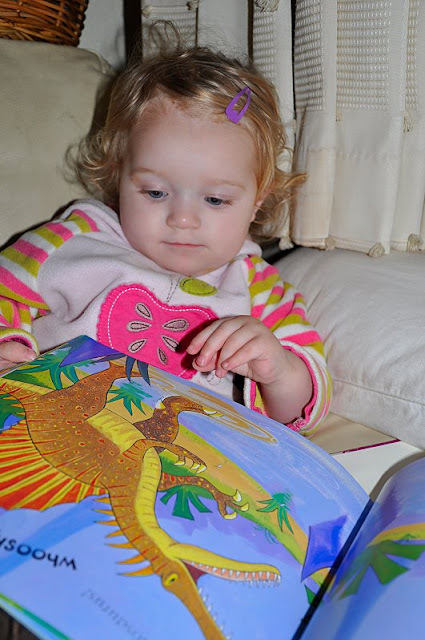 Taisia particularly liked one of her story books about Dinosaurs. She went to sleep shortly after this picture was taken, so Tiegan and I sneaked into the dining room to make a start on our Iron Age roundhouse model. We managed to get the painting stage done. For the base of the model we used a piece of mount board that I had picked up from the Scrapstore in Exeter. Aren't Scrapstores great? For those that don't know of them, basically the idea is that the store gets supplies given to them from local businesses in the main, but anyone is welcome to offer donations. Items range from unused yoghurt pots, fabric and netting, cardboard tubes, paper and card, sponge, boxes, wallpaper, etc - often end of line stock or off cuts. Sometimes it is like walking into a real treasure trove, but of course the stock varies from week to week depending on what has been brought in. I don't know how other Scrapstores operate, but the one I use has varying membership costs depending on whether you are a family or group. For a family membership with an annual fee of £7, I can fill a shopping basket full of goodies for £4. If things are too big for the basket they are just carried separately. If you don't fill a basket, a reduction is given at the discretion of the desk attendant. . The main rule to the scrapstore use is that items made from the donated stock can't be sold, nor can the actual scrap items be sold on. On top of the fill-a-basket thing, the Scrapstore also sells a variety of art and craft supplies. 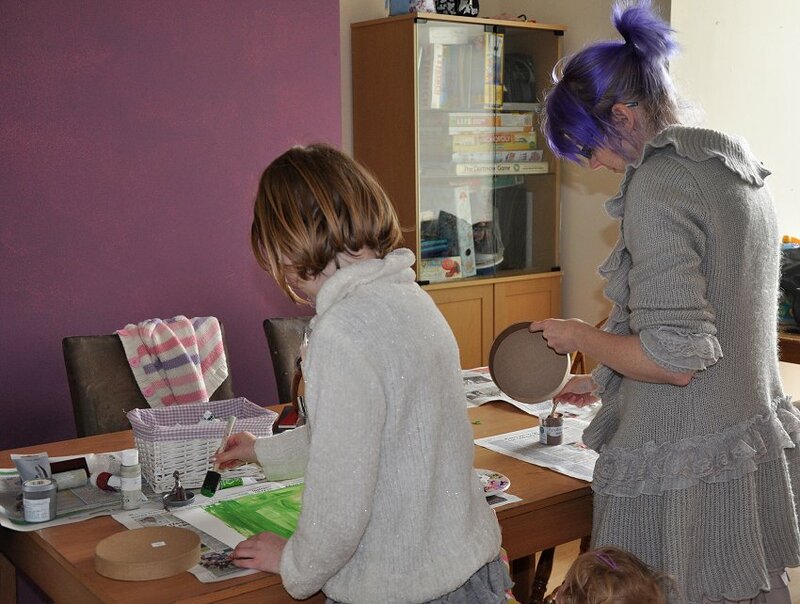 These include paint, glue, glitter, brushes and glue spreaders, felt squares, tissue paper etc. All in all they are rather useful places to visit and have a nice community feeling to them. If you want to see is there is a scrapstore near you, you can check this website here. We painted the mount board using a sponge brush and acrylic paint. 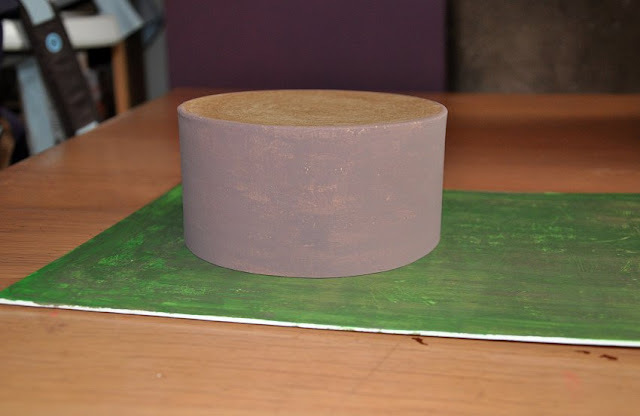 We mixed a medium green and brown together in various amounts to give a non-uniform coating. Once Lee got home from work and I had the car back, it was time for a speedy trip to the supermarket. I only went to get dinner for two nights, but ended up buying a few more things that made the total shop cost a small fortune. I did manage to pick up a nice outer jacket for Joseph in the sale though, and I treated the kids to the Smurfs DVD. Tiegan showed an interest in the Animal Planet magazine, which I flicked through and thought worthy of buying as it is just the kind of thing she loves. We came home, made Tacos and salad for dinner, and all sat together to watch the said Smurfs DVD. I must admit it made me giggle aloud on more than one occasion - I'm not sure what that says about my level of maturity. I took a couple of pictures just before darkness fell upon us. 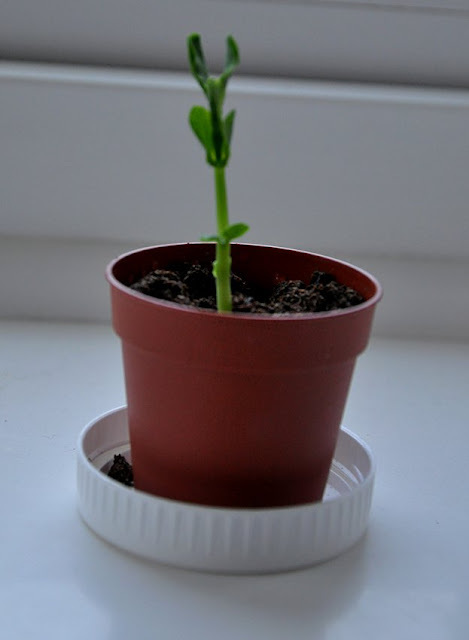 Firstly, Tiegan's pea seed on Day 8. We shall be transferring it to a larger pot very soon. And these beauties were screaming to be photographed. I truly love daffodils at this time of year. The vibrancy of their colour, their unique shape, the way they hold their heads with pride, and the way that they just seem to able to bring sunshine into the room - Just beautiful. I am loving them in this vessel. It was a charity shop bargain, I really like it's tall shapely shape. I think it was about £6.50 for the coffee (tea?) pot, milk jug, sugar bowl, and a set of 4 cups and saucers. 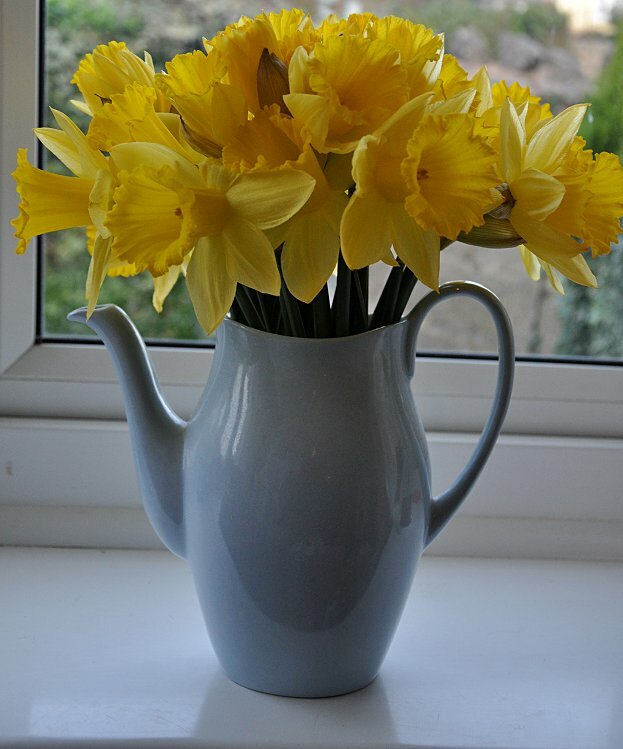 I was initially drawn to the gorgeous blue colour as it matches the colour I want to paint my kitchen but I think it makes the perfect daffodil holder. I'm toying with the idea of adding a decal to the front so it isn't so 'bare'. But for now I shall just stand back and admire the yellow beauty of it's contents. Hi, I just wanted to mention something that might help with the library fines. Our local library emails me 2 days before books are due back as a reminder. perhaps its worth asking if yours has a similar scheme you can sign up to. Its a shame to waste money that could otherwise be spent on charity shop bargains!